We believe that real, lasting transformation is possible. This is a challenging idea for many of us, since the experience of temporary change creates cynicism and, eventually, resignation. But we can say with confidence that change can happen on a deep, soul-level because we've experienced it for ourselves and we've seen it in so many others! Vision: We need a clear vision of where we're headed. Current Reality: We must be aware of where we are right now. Path: We need a path of transformation that leads us from our current reality to our vision. It's our goal to help you gain clarity around your "vision" and "current reality," and then to walk with you on the "path of transformation." Our "path of transformation" is based on what we see in the life of Jesus. We believe that Jesus lived a life characterized by practices of reflection, connection, and surrender. In the course of Jesus’ life upon this earth, we see a life of faithful and consistent surrender to the will of God. He lived a connected life, gathering a community of disciples, remaining in close communication with his mother and siblings, and even staying engaged with his critics and enemies. And he reflected God in all of his compassionate ways, regularly retreating in solitude to grow in God’s ways. We will grow in embodying God's love as we learn to live reflective, connected, surrendered lives. This element of the Path of Transformation relates to awareness and our ability to see - to see ourselves, to see God, to see others, to see the world. This awareness comes from living a life where we make space to be still and listen. It’s a life where we’re willing to confront whatever rises to the surface (fear, shame, painful memories, awareness of our own limitations), instead of repressing and ignoring and distracting ourselves through busyness and other means. It’s a posture of wondering about places of resistance and wrestling with them, instead of getting stuck in defensiveness and “right/wrong” thinking. To be reflective is to ask questions and be curious about our failures instead of running away from them. A person who is connected moves toward relationship instead of away. Connection is about reaching out across barriers to give and receive love. So often we want to retreat and withdraw, feeling that relationships are too messy, too painful. But we were created to live in community. We were created to know and be known. Without love and connection, our souls cannot come alive. our souls cannot come alive. “Surrender” is a hard word for many people. At the moment, many people in the culture at large are fascinated with mindfulness (a version of “reflective”) and community (= connected). 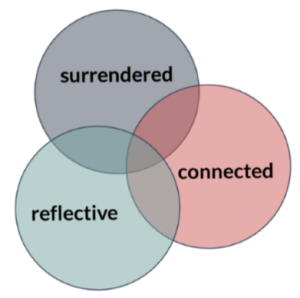 Surrender is probably the most countercultural of these three. To be surrendered is to be open instead of guarded. It is to be humble and teachable and able to receive from others. Surrender is a willingness to lay down our rights in service of something greater than ourselves. To “try on” a new idea is an act of surrender. To receive feedback from a coach is an act of surrender. To open yourself up to the voice and leading of God requires a spirit and posture of surrender. To read more, check out Understanding Our “Path of Transformation” and our Pursuing Transformation that Lasts (Our Guiding Principles of Transformation).